Nancy Withbroe, CFRE, Chief Operating Officer & Chief of Staff, provides strong day-to-day leadership for the staff, steering performance management to ensure alignment with NWLC’s strategic plan and organizational effectiveness goals – with a deep emphasis on equity and inclusion – and serves as a key thought partner to the President & CEO and the Board of Directors. 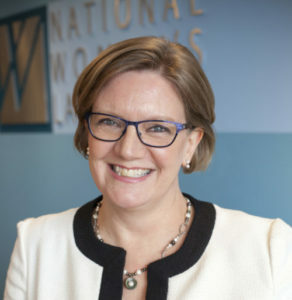 From 2013 to 2016 Nancy served as NWLC’s Vice President for Development and Strategy, leading efforts to substantially increase and diversify funding and facilitating a comprehensive strategic planning process with the Board and Co-Presidents. In between these roles she spent a year as the Vice President for Philanthropic Engagement & Chief of Staff at the Greater Washington Community Foundation. She has held many other fundraising and organizational development staff and consulting roles with leading national and regional nonprofits. Nancy has a master’s degree in educational leadership from American University and a bachelor’s degree from Carleton College. She was honored by the Association of Fundraising Professionals, DC Metro Area Chapter, as 2018’s Outstanding Fundraiser of the Year, in part for her role in launching the TIME’S UP Legal Defense Fund, which NWLC houses and administers.